During 1917 and 1918, German occupation stamps were issued for the Military Administration in Romania. The current stamps of Germany, as well as some of the Postage Due and Postal Tax stamps of Romania, were overprinted and / or re-valued. The M.V.i.R. overprint, used for many of these German and Romanian stamps, stands for "Militärverwaltung in Rumänien" or "Military Administration in Romania". At the beginning of June 1917, three Germania-type stamps were overprinted and re-valued in Romanian currency, for use as German occupation stamps in Romania. All of them, except the the 40 Bani on 30 Pf. denomination stamp, are shown in the image above (Mi. #1-3, Sc. Romania #3N1-3). The surcharges were applied in Berlin and were printed in black ink. The boxed M.V.i.R. overprints were applied in Bucharest. The overprint on the 20 Pf. stamp is in black. The other two denominations were overprinted in red. At the beginning of July 1917, four Germania-type definitive stamps were overprinted M.V.i.R. and re-valued in a more appealing format. All of them, except the 15 Bani on 15 Pf. denomination stamp, are shown in the image above (Mi. #4-7, Sc. Romania #3N4-7). German occupation stamps for use in all of Romania were issued on March 1, 1918. Five Germania-type definitive stamps were overprinted "Rumänien" and re-valued in Romanian currency. They are all shown in the image above (Mi. #8-12, Sc. Romania #3N8-12). On July 1, 1918, the 5, 10, 20, 30, and 50 Bani unwatermarked Postage Due stamps of Romania were overprinted with a boxed M.V.i.R. in red. No images of them are provided here (Mi. Portomarken #1-5, Sc. Romania #3NJ3-7). The two Postage Due stamps shown above, at the left (Mi. Portomarken #6-7, Sc. Romania #3NJ1-2), were issued in August of 1918, and they are printed on watermarked paper. The 10 B. stamp shown above, at the right (Mi. Portomarken #8, Sc. Romania #3NRAJ1), is a Postal Tax Due stamp of Romania. It was released in September 1918, and it is overprinted in black. Several varieties of the M.V.i.R. overprint were applied to seven 5 Bani and 10 Bani denomination Postal Tax stamps, as well as to some revenue stamps of Romania (Mi. Zwangszuschlagsmarken #1-7, Fiskalmarken #I-X, Sc. Romania #3NRA1-8), between June 1917 and October 1918. Three of the Postal Tax stamps are shown in the image above. Some of these stamps also exist on both white and grayish papers, and they are all listed in the Michel Deutschland-Spezial-Katalog. A 10 B. Postal Tax stamp of Romania was released in late 1917 with a boxed Gültig / 9. Armee overprint (Mi. N/L, Sc. Romania #3NRA8). The 10 Pf., 15 Pf., 20 Pf., and 30 Pf. definitive stamps of Germany were released in March 1918 with a boxed Gültig / 9. Armee overprint (Mi. Etappengebiet der 9. Armee #1-4, Sc. Romania #3N13-16). The 30 Pf. overprinted Germania-type stamp comes in two types, the peacetime printing and the wartime printing, the first of which is very rare. 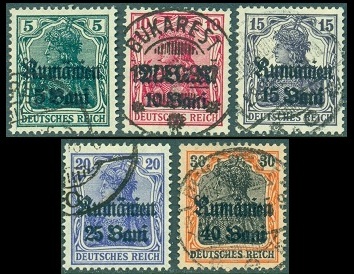 These overprints were utilized by the postal facilities of the German 9th Army in Romania. An example of the postal tax stamp, with this overprint, is shown in the image above.